It was a sinful irony really - as naughty as painting a beard on the Mona Lisa. That image of Ally MacLeod in Argentina in 1978, his head in his hands as the World Cup dream collapsed around him may have captured the moment. But it was scarcely a reflection of the life of the man. I will remember him with a bounce in his step, hands in his jacket pockets and that rather silly grin, surrounded by a Ready-Brek glow of enthusiasm for the game he adored. And that entrance to a room which always began with a cheery "how are we all?" You could set your watch by it. They tell me he could play a bit in his day and indeed he once turned out for Queen of the South reserves against St Mirren at Love Street at the age of 62. The handful of gaping fans in the ground that night may not, though, have seen the best of him. He was better as a giraffe of a left winger with a mop top haircut which flopped as he patrolled the touchline for dear old Third Lanark - the team he worshipped as a kid - St Mirren albeit very briefly and more famously Blackburn Rovers and Hibs. I only really began to know him in his management days, but it was clear even then that he believed passionately in what was right. As a Players' Union activist MacLeod played his part in the removal of the maximum wage, a lieutenant for Jimmy Hill, although his own pay packet was never in need of a wheelbarrow for transport. He left Blackburn for Hibs after being named man of the match in the cup final because his salary did not match that of his team mates. And even when they begged him to return with the offer of an increase his principles stopped him doing so because he reckoned that they should have offered him the money in the first place. He had that kind of dignity about him, had Ally. He did a phenomenal job at Ayr United. Thirty years on it is difficult to put into perspective what was going on down there. He exploded a bomb of football passion in sleepy Somerset and the fallout was deafening. The Old Firm used to quiver in their boots over the prospect of a trip down the A77. Old Spud Murphy, a full back who would kick his granny, the mercurial Johnny Doyle - another sad loss - and the lunatic Hugh Sproat, a goalkeeper who wore green when they played Rangers and blue when they played Celtic. They were one crazy gang. And it was Ally who woke Aberdeen from their slumbers, paving they way for Alex Ferguson. It was Ally who signed Willie Miller and Alex McLeish. But the truth is that Ally will be forever Scotland. At Wembley in 1977 they decanted a whole country to the terraces of London - a moment in time. I received a written warning from the newspaper editor who employed me because I was part of the pitch invasion with my pals and was spotted in the incredible throng from the press box by a colleague. But there were so many of us on the park that I met guys from Glasgow I hadn't seen in years. And despite what you have read elsewhere there wasn't so much wrong with Argentina. We would settle for that kind of adventure now, would we not? Ally took football in this country and gave it a right good shake. He dusted it generously with all his lovable enthusiasm and reminded us that it is, after all, only a game, fun and entertainment. 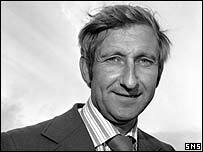 It wasn't fair on Scotland, losing Ally MacLeod and the wonderful Rikki Fulton in one week. National treasures - that's what they were.